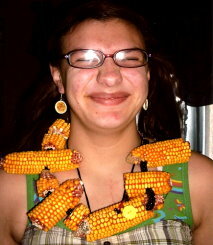 2012 The Ugly Necklace Contest! Land of Odds, Be Dazzled Beads, The Open Window Gallery, and The Center for Beadwork & Jewelry Arts are proud to announce the Winner and Runner-Up in this year’s The Ugly Necklace Contest, 2012! It’s not easy doing Ugly! So our hats are off, and we offer loud applause to Joan Veres and Pamela Orians. 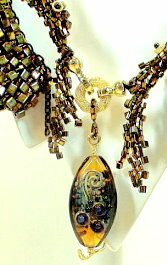 These beadwork and jewelry artists have demonstrated their commendable design skills. They have been judged, from among 17 entrants from across America, Dubai, Great Britain, and South Korea, by a distinguished panel of four judges from The Center for Beadwork & Jewelry Arts in Nashville, Tennessee, and voted on by visitors to the Land of Odds web-site. It’s difficult to design an ugly piece of jewelry because your mind and your eye won’t let you go there. As research into color and design has shown, your eye compensates for imbalances in color or design component relationships – it tries to correct and harmonize them. You are pre-wired to subconsciously avoid anything that is disorienting, disturbing or distracting. 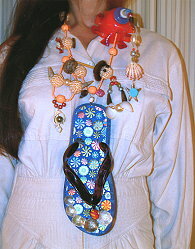 To view additional images of the necklaces submitted by the winner, runner up and the other semi-finalists of The Ugly Necklace Contest, please visit us here on-line. And if you are in the Nashville area, please stop by Be Dazzled Beads, where the 8 selected Ugly Necklaces are on display through September 15th.